We know and love Mustapha Tettey Addy for his kpanlogo music. He introduced that beautiful Ghanaian drum, rhythm and dance to the West. 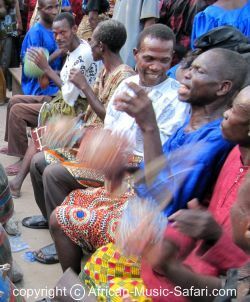 The growing fan base proves that the kpanlogo drum is a great, less commercialized alternative to the djembe. 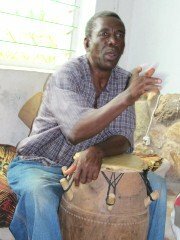 Mustapha was born into a family of drummers in 1942 and grew up in Avenor, a village of the Ga tribe in Ghana. Ga traditional drumming is probably the most complicate in Ghana. Mustapha learned these rhythms, songs and dances from his father and older brothers as a young child. He further deepened his knowledge of traditional music at the University of Ghana and on world tours with Ghana's National Dance Ensemble. However, it takes more than just a University degree to become a Master Drummer. In fact, the title "Master Drummer" doesn't really exist in the Ga language. A better translation of the African word would be "God's Drummer". Mustapha spent years touring Ghana and the neighboring West African countries. On these trips, he studied the traditional rhythms, dances and ceremonies of the various tribes. The result is a number of recorded African drumming albums. Without such records, African traditional music may soon disappear. Some of these rhythms are normally only to be played for kings and chiefs. Mustapha obtained special permission of chiefs and elders to record them. One afternoon, I stepped into Mustapha's living room while he was watching football on TV and asked him for an interview. Mustapha Tettey Addy is an approachable, kind and wise man, who loves to joke and laugh. But when the truth needs to be told, he's not afraid to risk stepping onto people's toes! "When you interview me, you have to know I talk hard!" What do you think about Mustapha?